I went on a listing appointment today...it's amazing how little touches such as a #LittleFreeLibrary can make a neighborhood really feel warm and inviting. Kudos to the neighborhood of Forest Glen. If you know someone looking for a 3BR home that is move-in ready, zoned for #Satchelford Elementary and is under $200,000 have them message me. When working with a buyer recently, we discussed what some of the expectations might be for maintaining an older home. It had copper pipes, we know they tend to develop pinhole leaks, to be fair, I guess all pipes will leak at some point. During our conversation, we talked about what to look for. Wouldn't you know it, my similarly aged and style of home began to reveal some of these tell tale signs. Now, about the title to this post, it really has rained in our foyer before. At first glance, I thought one of the children let the toilet overflow a bit (it happens) and with three children, it's happened more than once. 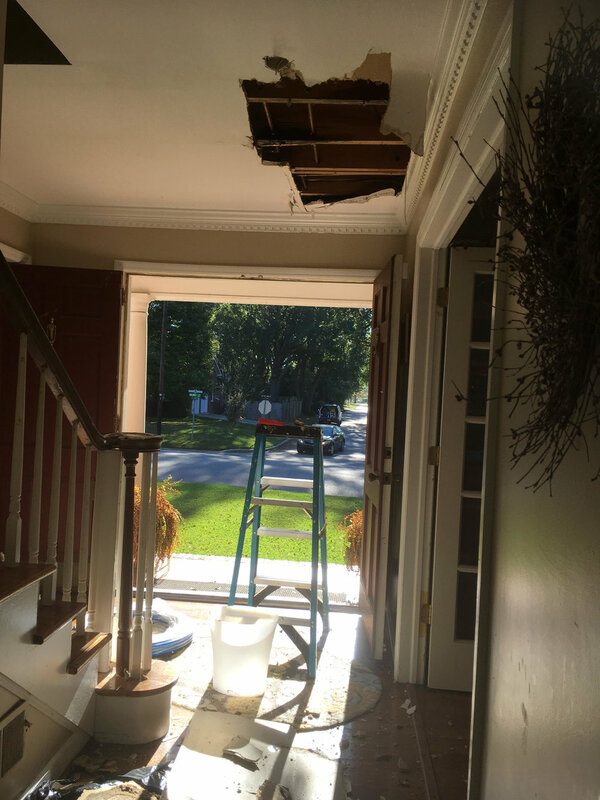 We know water is going to follow the path of least resistance so what was perplexing in this particular situation was that the water that seemed to follow a straight line, seemed to jump up and over a joist and then take a hard left. I thought, could this be two weaknesses? Little water spots showed up in 3 different areas. So, we called in our home warranty company. Now came the challenge of convincing the plumber to look a little further...thankfully, he was as curious as I was and sure enough....two separate pipes with pinhole leaks. That makes 5 leaks in 10 years and 4 ceiling repairs. Our next home will be a one story, thankfully, I know a good Realtor®. For more tips, read the full article from Inman News. Know someone who is thinking of selling?